Experience the professional creative artistry of our highly trained staff. We are able to make people look and feel their very best. 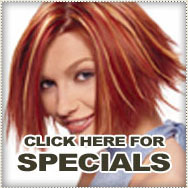 Discover the latest hair and color techniques featuring top of the line Redken Color Products and Matrix Products..